Doo Gro® Tingling Growth Shampoo with dandruff control helps stimulate blood flow to the scalp to help promote strong, healthy, growing hair. Its unique formula gently cleanses and conditions hair, while if adds strength and returns hair to its natural healthy condition. 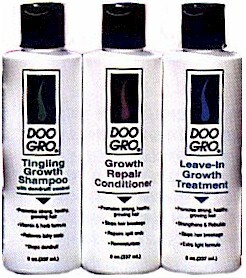 Doo Gro® Tingling Growth Shampoo with dandruff control moisturizes hair and scalp while dry, flaky and itchy scalp. Safe to use on hair that is relaxed, curled, natural, dry, overprocessed, breaking or damaged.